The Essentials of Identification Codes – Jeremy S. Wu, Ph.D.
Big Data promises to improve governance of society and better inform the public in the 21st century. Although every data record has some information to contribute, linking and merging relevant electronic records can minimize the collection of duplicate data and increase the value and utility of the integrated data rapidly and exponentially. Essential in this approach is the presence of identification codes that will facilitate the actual integration of record and data. The identification code is a key to unlocking the enormous power in Big Data. However, it may also be the primary cause of system failures, misuses and abuses, and even fraudulent or criminal activities, if it is not properly applied and managed. In addition to technology, statistical design and quality feedback loops, proper education and training, relevant policies and regulations, and public awareness are all needed for the effective and responsible use of identification codes and Big Data. When a student enters a school, a record will store the student’s name, gender, age, family background, field of study, and other data. When she takes a course and receives a final grade, the results are recorded. When she satisfies all the requirements for graduation, another record will show the grade point average she has achieved and the degree she is awarded. Each record represents a snapshot for the student. The records are collected over time for administrative purposes. Together the longitudinal snapshots provide comprehensive information about the education of a student. When the student enters the workforce, additional data are collected over her lifetime about the industry and occupation she works in, the job she performs, the wages and promotions she receives, the taxes and insurances she pays, and the employment or unemployment status she is in. In like manner, massive amounts of data are collected about a firm, including its initial registration as a business, periodic reports on revenues and expenses, entry into the stock markets, acquisitions or mergers with other companies, payment of taxes and fees, growth in sales and staffing, and expansion or death of the business. 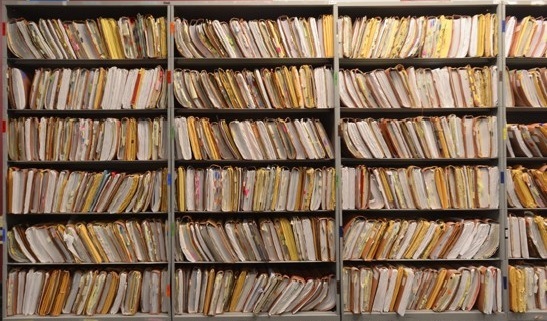 These administrative records used to be stored in dusty file cabinets, but they are now mostly digitized and available for computer processing when the Big Data era arrived at the turn of the millennium. Timely and proper integration of the records of all students would provide unprecedented details about how the school is performing, such as its graduation or dropout rate over time. Further roll up of all schools would inform a nation about its state of education, such as its capacity to support employment and economic growth. This is what Big Data promises to bring in the 21st century. From allocation of resources, measurement of performance, to formulation of policy, every segment of society can benefit from the details and insights of Big Data to improve governance and inform the public. Although every data record has some information to contribute, linking and merging relevant electronic records minimizes the collection of duplicate data and increases the value and utility of the integrated data exponentially. Essential in this approach is the presence of identification codes that will facilitate the actual integration of record and data. Statisticians can make significant contributions to building new statistical systems with their thinking and methods in this process. The name of an individual or a company was the preferred identification code when files were still physical, such as in paper form. It has been conventional to consolidate records under the same name and sort them by alphabetical order in English, number of strokes in Chinese, or chronological order. However, a major shortcoming of using names, especially when processed massively by computer, is that they are not unique. The top four family names of Lee, Wang, Zhang, and Liu accounted for 334 million individuals in China in 2006 , exceeding the total U.S. population. Chinese names may also appear differently because of the simplified and traditional characters. The English first name of Robert, the 61st most popular male name at birth in the U.S. in 2011 [2,3], can have at least 7 common variations for the same person, including Bert, Bo, Bob, Bobby, Rob, Robbie, and Robby. Bert may also be short for Albert. Individuals may apply to change their names or use more than one name; women may change their names after marriage. Human errors can add errant names. References to the same name across nations with different languages can be notoriously difficult. The name of a company is usually checked and validated to avoid duplication during the registration process and protected by applicable local, national and international rules and laws including trademarks after registration. The company may use multiple names including abbreviations and stock market symbols; it can also change its name due to merger with another company, acquisition agreement, reorganization, or a simple desire to change its brand. A non-unique identification code poses the risk of linking and merging records incorrectly, leading to incorrect results or conclusions. Supplementing a name with auxiliary information, such as age, gender, and an address, would reduce but not eliminate the chance of record mismatches, and at the cost of increasing processing time. A series of numbers, letters and special characters (alphanumeric) or a series of numbers alone (numeric) is increasingly used as the identification code of choice with modern machine sorting, linking, and merging of electronic records. Numeric codes tend to be less restrictive because they are independent of the writing system. Alphanumeric codes using letters from the English alphabet may be suitable for systems using languages based on the Latin alphabet, but systems using non-Latin scripts may still find them unavailable or difficult to use, understand, or interpret. It is also easier to understand how numeric codes are sorted compared to alphanumeric codes. When the Social Security Act of 1935 was passed in the U.S., one of the first challenges in implementation was to create an identification code that would “permanently identify each individual to be covered” and “be sufficiently elastic to function indefinitely as additional workers became covered” . An 8-field alphanumeric code was initially chosen, but it was soon rejected by the statistical agencies, as well as labor and justice departments. This exchange was described [4,5] as the first sign of “the tremendous impact machines would have on the way [government] would do business.” This was BEFORE computers were introduced for actual use. Today, the impact of information technology is obvious and continues to increase in every aspect of government, business, and individual activities. An identification code may be applied to a person, a company, a vehicle, a credit card, a cargo, en email account, a location, or just about any practical entity. An electronic record that does not contain an identification code or cannot be correctly linked with other records may be described as lacking in “structure” or “unstructured” in the Big Data era. Since the beginning of the 21stcentury, “unstructured” data are occurring in much higher frequency than “structured” data. However, they contain relatively limited information content and utility compared to “structured” data, especially for continuing, consistent, and reliable information about a society or an economy over time. Effective use of the identification code is a key to unlocking the enormous power inherent in Big Data. Match and Merge Records. Ideal identification codes are mutually exclusive and exhaustive, establishing an unambiguous one-to-one relationship between the code and the entity, including those yet to appear in the future. The code facilitates direct and perfect machine sorting, matching, and merging of electronic records, potentially increasing the amount of information about the entity with no limit. Anonymize and Protect Identity. A code offers the first-line protection of identity by anonymizing the entity. Due to the increasing importance of the code and the relative ease of linking with other records, the risks and stakes of identity fraud or theft through the identification code have also risen, requiring responsible policy and management of the code as safeguards. Provide Basic Description and Classification. An identification code can provide the most basic description of the content and context of the data records, from which simple observations or summaries can be quickly derived. Over time, this concept also evolved into codes for classification and the separate development of “metadata” [6,7] for efficiently building structure into data systems and broadening their use across systems. Perform Initial Quality Check. Unintentional human errors in typing or transcribing an identification code incorrectly may damage the quality of integrated data and the eventual analytical results. Fraudulent or malicious altering of the identification codes may inflict even more severe damage to the integrity and reliability of the data. Early detection with the deployment of “check digit” [8,9] in the identification code may eliminate more than 90 percent of these common errors. Facilitate Statistical Innovations. By collecting and integrating data continuously for each entity such as a student, a dynamic frame with rich content can be built for all students and all schools. New data elements may be defined for analysis; statistical summaries may be produced in real time or according to set schedules to describe the performance of a school or the state of education for a nation, while strictly protecting the confidentiality of individuals and security of their data. Innovative efforts to construct these dynamic frames, or longitudinal data systems, have started in the U.S. and China . The Data Quality Campaign  lists “a unique statewide student identifier that connects student data across key databases across years” to be the top essential element in building state longitudinal data systems for education in the U.S. The U.S. does not have a national identification system. The Social Security Number (SSN) was created to track earnings of workers in the U.S. in 1936, before computers were introduced for commercial use. Its transition into the computer age revealed some of the strengths and weaknesses of its evolving role as an identification code. Demographic data are collected in the SSN application , including name, place of birth, date of birth, citizenship, race, ethnicity, gender, parents’ name and SSN, phone number and mailing address. 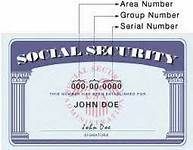 The U.S. Social Security Administration is responsible for issuing the SSN. Some of the SSN are reserved and not used. Once issued, a SSN is supposed to be unique because it would not be issued again. However, some duplicate situations exist. A wallet manufacturer decided to promote its product in 1938 by showing how a copy of a Social Security card from one of its employees would fit into its wallets, which were sold through department stores . In all, over 40,000 people mistakenly reported this to be their own SSN, with some as late as in 1977. Use of the SSN by the government and later the private sector has expanded substantially since its creation. Beginning in 1943, federal agencies were required by executive order to use the SSN whenever the agency finds it advisable to establish a new system of permanent account numbers for individuals . In the early 1960s, federal employees and individual tax filers were required to use SSN. In the late 1960s, SSN began to serve as military identification numbers. Throughout the 1970s when computers were increasingly used, SSN was required for federal benefits and financial transactions such as opening bank accounts and applying for credit cards and loans. Beginning in 1986, parents must list the SSN for each dependent for whom the parents want to claim as a tax deduction. The anti-fraud change resulted in 7 million fewer minor dependents being claimed in the first year of implementation . As SSN became essentially an unofficial national identifier that can link and merge many electronic files for the same person together, it can also be the direct cause of misuse and abuse such as identity theft . The SSN does not have a check digit; it cannot be used reliably for authentication of identity. Academic researchers have also demonstrated ways to use publicly available information “to reconstruct SSN with a startling degree of accuracy” . These identified vulnerabilities have resulted in more cautious, secured, and responsible use of the SSN in the U.S. in recent years. The original 1943 executive order requiring the use of SSN was rescinded and replaced by another executive order in 2008 that makes the use of SSN optional. Security offices at county-level local governments issue the resident identification cards to individuals upon application no later than age 16. Data collected include name, gender, race, birthdate, and residential address. The resident identification cards may be valid permanently or for a time period as short as 5 years, depending on the age of the applicant. 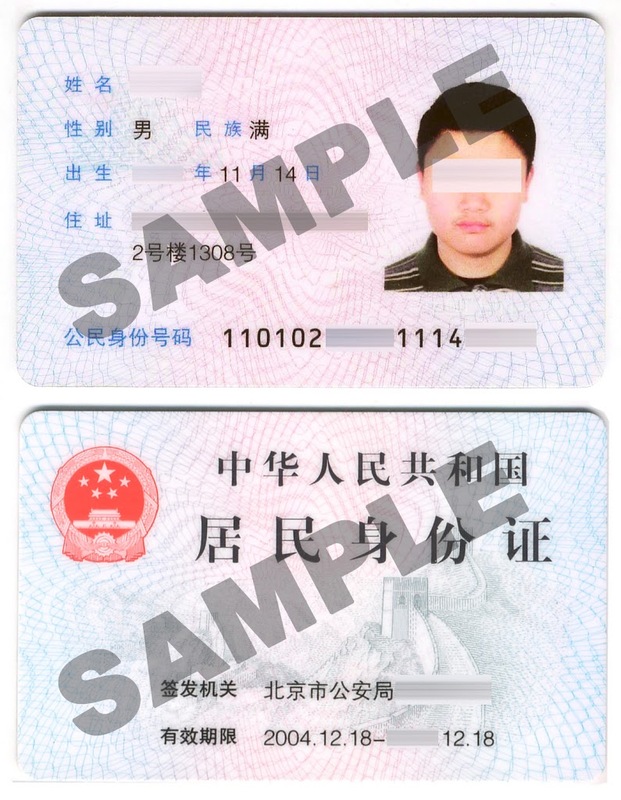 According to official announcements, the RIN is also used to track individual health records in the National Electronic Health Record System in China . An Employer Identification Number (EIN) to a business is equivalent to the SSN to an individual in the U.S. . However, a business in this case may also be a local, state, or federal government; it may also be a company without employees or an individual who has to pay withholding taxes on his/her employees. The EIN is a unique 9-digit number assigned by the U.S. Internal Revenue Service (IRS) according to the GG-NNNNNNN format, where GG was a numerical geographical code to the location of the business prior to 2001 and the remaining 7 numeric digits have no special meanings. Once issued, an EIN will not be reissued by IRS. In addition, each state has its own, different Employer Identification Number for its tax collection and administrative purposes. Information collected about the business during the EIN application process include legal name, trade name, executor name, responsible party name, mailing address, location of principal business, type of entity or company, reason for application, starting date of business, accounting year, highest number of employees expected in the next 12 months, first date of paid wages, and principal activity of business . U.S. statistical agencies use the North American Industry Classification System (NAICS) to classify business establishments for the purpose of collecting, analyzing, and publishing statistical data related to the U.S. economy . NAICS was adopted and replaced the Standard Industrial Classification (SIC) system in 1997. One of the strengths of the hierarchical system is that aggregation can be performed easily up the chain. For example, sum of all 311X companies should form the 311 Food Manufacturing industry in the U.S. Consistent creation and assignment of NAICS codes is a challenge in a global, dynamic economy where obsolete industries may disappear and new industries may spawn and grow overnight. Examples of challenging industries include “high technology” industries in the past and the recent “green” industries. Application of the NAICS codes is subject to interpretation and consistency issues. For example, the U.S. Census Bureau and the U.S. Bureau of Labor Statistics disagree in creating and maintaining their respective business frames due to differences in data sources and assignment of NAICS codes . Inconsistent use of NAICS codes disrupts or even invalidates analysis and interpretation of time series or longitudinal data. A new business in China must apply to the local Quality and Technical Supervision Office for a 9-digit National Organization Code, which contains 8 digits and 1 check digit . The Chinese regulation, GB 11714-1997 on Rules of Coding for the Representation of Organizations, is patterned after international standards, ISO 6523 Information Technology – Structure for the Identification of Organizations and Organization Parts . Online directories exist to look up information about the organization based on the National Organization Code . The value of the Chinese Industrial Statistical Dataset is well recognized by economists and other analysts domestically and internationally. Substantial resources were invested into the construction and maintenance of the comprehensive data system that describes almost all state-owned and large enterprises (annual sales of over RMB Ұ5 million until 2010 and over RMB Ұ20 million thereafter) in China longitudinally since 1998. However, serious data quality problems have been reported, and the primary cause can be traced to the inconsistent and incorrect application of the identification codes . This situation exists although China started its standardization of organization codes in 1989 and is currently in the third phase of implementation . As recently as last month, Guangdong province has announced its commitment to use a shared platform on the National Organization Codes as part of its campaign to combat corruption . As technology continues to evolve and grow, larger amount of digitized data will be collected more rapidly at relatively low cost. This has characterized the Big Data era. These Big Data contain unprecedented amount of information. If integrated and structured, their value and power will be increased exponentially beyond any existing statistical systems have been able to provide. Identification codes that facilitate linking and merging of records hold the key to unlocking this enormous trove of opportunities. As the gateway to the enormous power of Big Data, identification codes may also be the primary cause of system failures, misuses and abuses, and even fraudulent or criminal activities, if they are not properly applied and managed. The practical challenges of applying an identification code are complex. In addition to technology, statistical design and quality feedback loops, proper education and training, effective policies and regulations, and public awareness are all needed for the effective and responsible use of identification codes. These topics will be discussed in future papers. 360doc.com. Quantitative Ranking of Chinese Family Names (中國姓氏人口數量),November 25, 2012. Available at http://www.360doc.com/content/12/1125/17/6264479_250155720.shtml on April 29, 2013. Wikipedia. Robert. Available at http://en.wikipedia.org/wiki/Robert on April 29, 2013. U.S. Social Security Administration. Change in Name Popularity. Available at http://www.ssa.gov/OACT/babynames/rankchange.html on April 29, 2013. U.S. Social Security Administration. Fifty Years of Operations in the Social Security Administration, by Michael A. Cronin, June 1985. Social Security Bulletin, Volume 48, Number 6. Available at http://www.ssa.gov/history///cronin.html on April 29, 2013. U.S. Social Security Administration. The Story of the Social Security Number, by Carolyn Puckett, 2009. Social Security Bulletin, Volume 69, Number 2. Available at http://www.ssa.gov/policy/docs/ssb/v69n2/v69n2p55.html on April 29, 2013. Wikipedia. Metadata. Available at http://en.wikipedia.org/wiki/Metadata on April 29, 2013. Wikipedia. 元数据. Available at http://zh.wikipedia.org/wiki/%E5%85%83%E6%95%B0%E6%8D%AE on April 29, 2013. Wikipedia. Check Digit. Available at http://en.wikipedia.org/wiki/Check_digit on April 29, 2013. Wikipedia. 效验码. Available at http://zh.wikipedia.org/wiki/%E6%A0%A1%E9%AA%8C%E7%A0%81 on April 29, 2013. Data Quality Campaign. 10 Essential Elements of a State Longitudinal Data System. Available athttp://www.dataqualitycampaign.org/build/elements/1 on April 29, 2013. U.S. Social Security Administration. Application for a Social Security Card, Form SS-5. Available at http://www.ssa.gov/online/ss-5.pdf on April 29, 2013. U.S. Social Security Administration. Social Security Cards Issued by Woolworth. Available at http://www.socialsecurity.gov/history/ssn/misused.html on April 29, 2013. Wikipedia. Social Security Number. Available at http://en.wikipedia.org/wiki/Social_Security_number, on April 29, 2013. President’s Identity Theft Task Force. 2007. Combating Identity Theft: A Strategic Plan. Available at http://www.idtheft.gov/reports/StrategicPlan.pdf on April 29, 2013. Timmer, John. New Algorithm Guesses SSNs Using Data and Place of Birth, July 6, 2009. Available at http://arstechnica.com/science/2009/07/social-insecurity-numbers-open-to-hacking/ on April 29, 2013.
 baidu.com. GB11643-1999 Citizen Identity Number 公民身份号码. Available at http://wenku.baidu.com/view/4f19376348d7c1c708a14587.html on April 29, 2013. Wikipedia. Resident Identity Card. 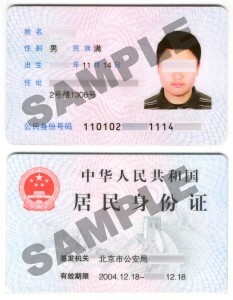 Available at http://en.wikipedia.org/wiki/Resident_Identity_Card_%28PRC%29 on April 29, 2013. Wikipedia. ISO 7064. Available at http://en.wikipedia.org/wiki/ISO_7064:1983 on April 29, 2013.
 baidu.com. Electronic Health Record 电子健康档案. Available at http://wenku.baidu.com/view/348d5a18a300a6c30c229fec.html on April 29, 2013. Wikipedia. Employer Identification Number. Available at http://en.wikipedia.org/wiki/Employer_identification_number on April 29, 2013. U.S. Internal Revenue Service. Form SS-4: Application for Employer Identification Number. Available at http://www.irs.gov/pub/irs-pdf/fss4.pdf on April 29, 2013. U.S. Census Bureau. North American Industry Classification System. Available at http://www.census.gov/eos/www/naics/index.html on April 29, 2013. National Administration for Code Allocation to Organizations. Introduction to Organizational Codes, 组织机构代码简介. Available at http://www.nacao.org.cn/publish/main/65/index.html on April 29, 2013. Wikipedia. ISO/IEC 6523. Available at http://en.wikipedia.org/wiki/ISO_6523 on April 29, 2013. National Administration for Code Allocation to Organizations. National Organization Code Information Retrieval System, 全国组织机构信息核查系统. Available at http://www.nacao.org.cn/ on April 29, 2013. Nie, Huihua; Jiang, Ting; and Yang, Rudai. A Review and Reflection on the Use and Abuse of Chinese Industrial Enterprises Database. World Economics, Volume 5, 2012. Available at http://www.niehuihua.com/UploadFile/ea_201251019517.pdf on April 29, 2013. National Administration for Code Allocation to Organizations. Historical Development of National Organization Codes, 全国组织机构代码犮展历程. Available at http://www.nacao.org.cn/publish/main/236/index.html on April 29, 2013. National Administration for Code Allocation to Organizations. Guangdong Aggressively Promotes the Use of identification Codes in its Campaign against Corruption, 广东积极发挥代码在反腐倡廉中的促进作用, March 7, 2013. Available at http://www.nacao.org.cn/publish/main/13/2013/20130307150216299954995/20130307150216299954995_.html on April 29, 2013.
 baidu.com. National Economic Industry Classification, GB-t4754-2002, 国民经济行业分类(GB-T4754-2002)(总表). Available at http://wenku.baidu.com/view/69f04af8c8d376eeaeaa31cf.html on April 29, 2013.